We’ve showcased several attempts at creating the ultimate invisibility cloak – but the “Anti-Shark” Wetsuit is the world’s first design that renders divers and surfers invisible to sharks! Entrepreneurs Hamish Jolly and Craig Anderson teamed up with the University of Western Australia’s Oceans Institute to develop a wetsuit that uses scientific data about sharks’ eyesight to prevent life-threatening attacks on humans. 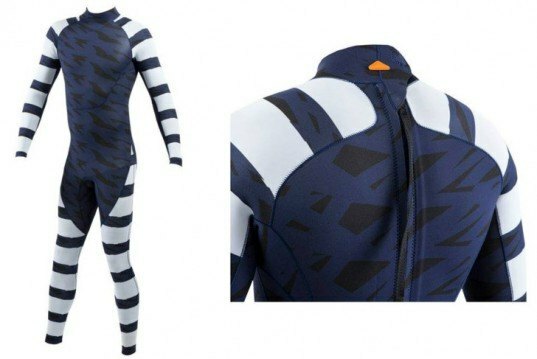 The team’s first suit, named “Elude,” uses the fact that sharks are color-blind to camouflage a swimmer or diver in the sea. The team has also developed another suit called “Diverter” to ward off potential shark attacks. The Elude is designed primarily for snorkelers and uses the knowledge of sharks’ perception of light and color to “hide you in a water column”, said Craig Anderson, entrepreneur and co-founder of Shark Attack Mitigation Systems. The second suit uses natural repelling techniques and a href=”https://inhabitat.com/tag/smart-materials/” target=”_blank”>materials that visually confuse the sharks. The suit is covered in white and dark-blue stripes, which make it look like an unpalatable food item to sharks, as UWA researcher Shaun Collin put it. After spending two years developing the technology, the researchers finally tested the suits at the West Australian Coast, dubbed “the deadliest coast in the world” due to the number of shark attacks. Doesn't matter how the coloration or patterns are optimized in my opinion. Your silhouette will still be in the shape of their favorite food source. If I were a betting man I'd say this won't work for surface swimmers / surfers. We’ve showcased several attempts at creating the ultimate invisibility cloak - but the “Anti-Shark” Wetsuit is the world’s first design that renders divers and surfers invisible to sharks! Entrepreneurs Hamish Jolly and Craig Anderson teamed up with the University of Western Australia’s Oceans Institute to develop a wetsuit that uses scientific data about sharks’ eyesight to prevent life-threatening attacks on humans.